Remember the joke about a toddler totting a BlackBerry and running round town? Well, it’s about to come true. Your gadget-loving kids could be very curious about the beep from your smartphones and probably wonder about the BlackBerry you carry around with you. To expose kids to gadgets and assist them in learning, toy maker, LeapFrog has introduced an interesting mini BlackBerry, Text & Learn, which caters particularity to toddlers three and up. 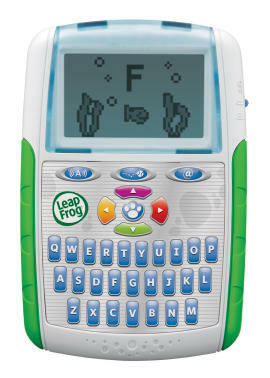 The size of the LeapFrog Text & Learn is slightly bigger than a normal smartphone or BlackBerry even though it is nicknamed “Baby BlackBerry”. Toddlers can make use of this gadget to polish up their language, play games and also learn some basic computer skills. Toddlers can imitate their parents to send text messages and browse the “web”. They can enjoy messaging with a virtual pal Scault (a quasi-imaginary friend) while exploring web browsing (pretend mode). The tiny gadget also offers kids with a handful of gaming activities such as shape identification, letter matching, QWERTY keyboard navigation, etc. Leapfrog has yet to reveal the pricing and the availability of this interesting Text & Learn. To give your kids that slight technological advantage and edge in life, a Baby BlackBerry might just be the gadget to invest in this year.